This column features stories from students exploring the intersection of creativity and technology through Hive Learning Network programs in NYC and Chicago. One of my favorite things to do is take photos within the four walls of my bedroom, just to see how far I can bend them. I found the inspiration for this set from a quantum physics movie I had watched; we don't think about it, though we assume that when you touch a cement wall, your hand will stop and not be able to pass through. It's common sense, right? But maybe in a slanted universe that we aren't conscious of, it is possible to push your hand through a wall or walk on the ceiling. Maybe it is possible to push past the boundaries in this dimension. I would lay in bed after looking at some of David Talley's work and think these thoughts while wondering at all the things that I could do with my Canon Rebel, ways I could bend and warp the boundaries of my bedroom walls. "For a Dreamer, Night's the Only Time of Day"
To me, this photo represents children's hopes and aspirations. 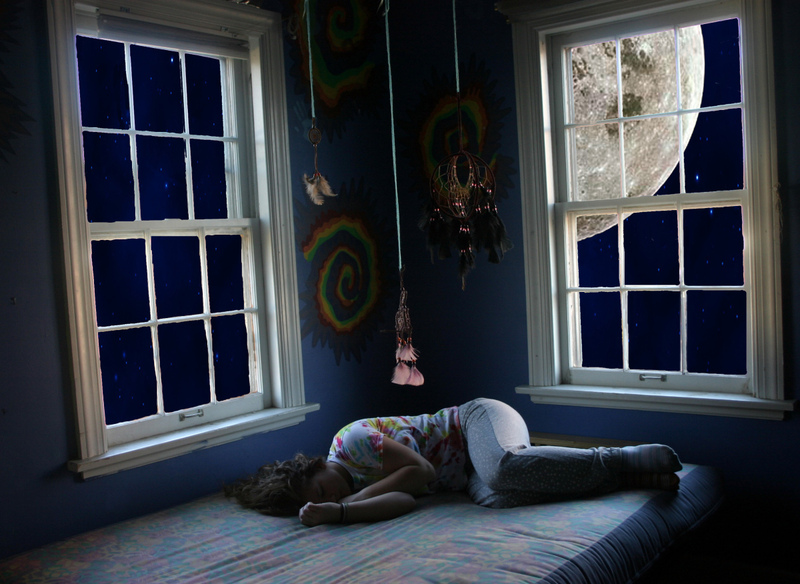 I've always seen this as a young girl in her room, wishing and wanting for all her dreams to come true, as she is trying to shoot for the moon and the moon, in it's own silent way, is cheering her on.